Avie continues to champion the works of Hans Gál with the label’s first foray into the “continental Briton’s” orchestral oeuvre. The album of three premiere recordings is framed by two works for violin and orchestra, both from the 1930s but written under entirely contrasting circumstances. When he wrote the Violin Concerto in 1931-32, Gál was at the height of his career and enjoying widespread recognition. By the time the Concertino was composed in 1939, his life had been turned upside down by the catastrophic Nazi occupation of Germany and later Austria, forcing Gál and his family to flee to England in 1938. Despite this life-altering situation, Gál’s musical language remained remarkably steadfast – optimistic and true to his tonal core; the differences between the Concerto and the Concertino are essentially a matter of scale, not of style. Gál’s epic 3-part symphonic Triptych stems from 1970 and was composed in less than a month, an astonishing burst of creative energy for one in his 80th year. A fitting testimony to Gál’s life and outlook, the work’s finale is exuberant, virtuosic and totally life-affirming. German violinist Annette-Barbara Vogel, who previously recorded a disc of Gál’s chamber works with piano for Avie, has become one of the composer’s most committed proponents. 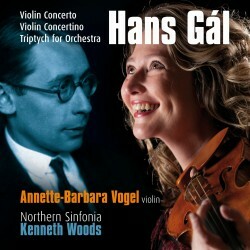 She says, “Early on, I was struck by how genuine and pure Gál’s music was …” In both supporting and main roles, Northern Sinfonia give ardent performances under the baton of up-and-coming American conductor Kenneth Woods.